In today’s world, travel isn’t restrictive. Regardless of whether you’re fit and healthy, have a physical impairment; learning disability or other condition, there is no excuse to avoid travelling. You’ll be able to visit even the most exotic of destinations to experience what our planet has to offer. Medication – this is vital to your packing. Ensure you have enough for both the duration of your trip plus a little extra in the event of delays. Overseas pharmacies may have a language barrier to stocking up on medication, so make sure you know both the name of the medication and dosage, and what it does – this should help in translation. Obtain a doctor’s letter to keep with you to outline your disability, the medication you’re on and the conditions of your health. Depending on your impairment, the airline may ask you to complete a form (MEDIF) and varies from company to company. You can print this off from their website. Equipment – You wouldn’t think much of equipment you require at home, but it’s extra luggage you will need to bring along for your travels. Make a note of everything you need and contact the airline to find out if they’ll have to make specific arrangements. For instance, those with a mobility scooter may need to remove the battery and have it stored separately during travel. your equipment. Book ahead to arrange a taxi or minibus that can provide this. And give yourself plenty of time for getting there. Plan to arrive 3 hours in advance to airports to give yourself leeway should their be delays or traffic. Accommodations – Depending on your disability you may require ramps or lifts to access rooms above the ground floor. Double check before booking or ask for ground floor to help avoid difficulty. You can use Google street view to get an idea of the local surrounding terrain is like, including shops and supermarkets. Be specific when asking about accessible rooms. You may require hand bars, lower wardrobes, and/or roll in showers. 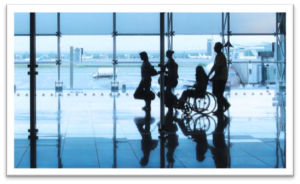 Activities – Don’t let your disability prevent you from seeing the sights. There is no reason why you shouldn’t be able to take part in snow sports, visit the pyramids of Egypt or discover Peru’s Machu Picchu. Water parks and attractions should all be accessible. Check with the facilities before making a booking to ensure your requirements can be met. Emergencies – Certain emergencies may arise, like visiting a hospital for treatment, these can be stressful when you can’t speak the language. Try to locate the nearest hospital and pharmacies before you go. This will save time if an emergency does occur. Take some time to learn basic phrases in that language, like the names of medical conditions, etc. Write down the emergency number to call. This changes around the world. In Europe it is 112.